So after a cornucopia of random happenstance and pure craziness, we have survived the pure nerdy wonder that is known as PAX. It was a tremendous battle that truly tested our wits. But not only can we declare the experience a success, we can say that the prank we worked hard to set up this year was a success as well. Not only because we were able to perform the prank with great responses but, more importantly, because everyone had fun. I’ll start at the beginning by saying that the prank we tried hard to keep secret until PAX was, in fact, a Boo Flashmob. 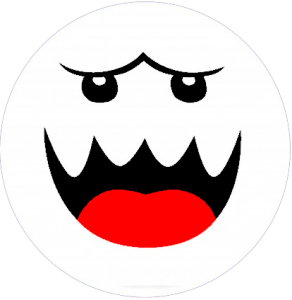 For those that were unable to catch it at PAX, we had multiple people wearing Super Mario World Boo masks, creeping up from behind certain individuals with their backs turned, and covering our faces when they turned toward us. We also had the Haunted Castle music to accompany the haunts. It was beauty and true in its nerdy form. We started off Friday by haunting Wil Weaton. It couldn’t have gone better. The coordination by our Boos was done exquisitely, and Wil was laughing and smiling the entire time. We continued with a couple more hits of everyday nerds on Friday. Saturday took with a beautiful haunt of a Nintendo rep in the expo hall and, later, with a gamer playing Darksiders. The hauntings continued to grow, and we were hitting our stride but were far from finished; we had one more to do. The big Kahuna, the head honchos, the money shot of pranks at PAX: Gabe and Tycho. It worked out just as planned. Get Gabe and Tycho to close their eyes: Check. Get 40 Boos to rush around the stage: Check. Get the crowd to cheer and enjoy the moment: Oh hell yeah! I wish I had a video to link you to of this but, being the one behind the mic, I got to see the Boos rush the stage with five cameramen following to catch the moment. It was a sight that made me as giddy as the first time I saw the “Where The Wild Things Are” trailer. It made my heart skip a beat and made me proud to be a nerd and to be a part of such a great moment. Gabe and Tycho were great sports about the whole thing, but principally I have to thank the men and women who participated in this prank. You are the people who made this possible. You took time out of your busy PAX schedules and skipped multiple panels and other events to make our dreams come true, and I have to thank you all from the bottom of my heart for your efforts. I know the rest of the Epic Default staff would agree. In the end it was a tough challenge, but we succeeded. We tried hard to show that we could do another prank for you guys because that’s what we love doing: bringing more fun to the table. We are already scheming for next year, and who knows what’s in store. But we do know it will be big, it will be crazy, and it will be fun. And as long as you guys can enjoy it, then we have done our jobs. We salute you all. Editor’s Note: Here is video of Wil and G&T on the YouTubes embedded below for your enjoyment.